Where Have the Sauger Fish Gone? Sauger Fish, once a winter staple on the Tennessee River, have largely disappeared to such an extent that fishermen rarely pursue them. The fish emerged from the water a glistening, cylindrical image of gold, brown, and amber, eyes a fiery red, and mouth brimming with teeth. The young angler who had pulled the fish from the water stared with an overly inquisitive look and soon voiced the simple question that was already etched on his face. “What is it?” he said. The distinctive catch definitely wasn’t a white bass. The young fisherman had laden his stringer with perhaps a dozen or so “stripes” as they were once commonly called. He also knew it wasn’t a smallmouth. The boy had just caught a decent smallmouth, one big enough to have already developed some tiger stripes down the side, and I had convinced him to release it just a few moments prior. I told him the multiple names of the mystery fish. “It’s a sauger, better known around here as a jack or jack salmon,” I said. “Can I keep it?” the boy asked. A crowd of perhaps a dozen anglers had gathered on the south bank below Wheeler Dam on the Tennessee River despite the fact that the air temperature hovered just above freezing on a cold December day. I don’t remember if that day was 20 or 25 or 30 years ago. 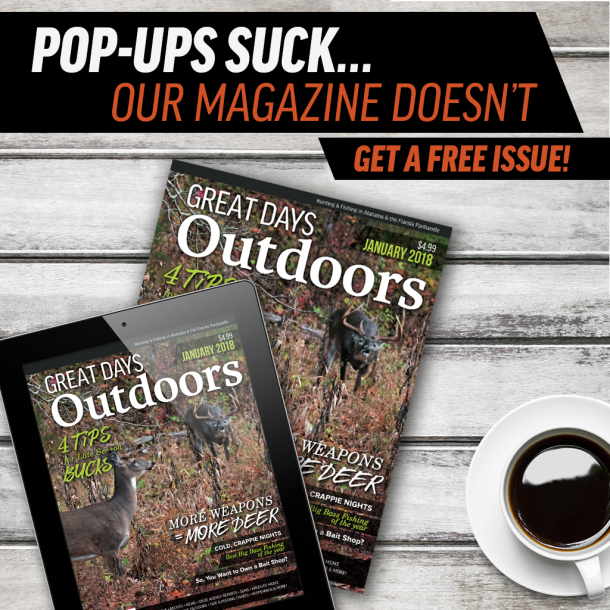 I do know that the gathering was not uncommon at the time, as anglers from across north Alabama and southern Tennessee congregated below dams during the winter and early spring months along the Tennessee River and attempted to catch one jewel of a fish. The sauger fish, a member of the perch family and cousin to the yellow perch and walleye, ranked as a winter prize for local fishermen at a time when fishing for bass, crappie, or catfish was not the year-round pursuit that it would become in the years to follow. Flash forward to the present. 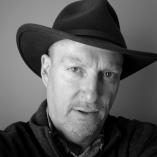 Rarely – actually never – do I see the congregation of anglers below Wilson or Wheeler or Guntersville dams as I once saw them, at least gatherings intentionally fishing for sauger. Once abundant with natural cycles of peaks and valleys, sauger populations have largely disappeared on all Tennessee Valley Authority impoundments in north Alabama. The fish haven’t totally disappeared, but intentionally catching even a few fish became a tedious chore. Only in the last year or so has a hint of a rebound starting to occur. Generally, around 2005 is the time that some anglers remember a decent catch of sauger fish although scientific studies indicate the population began to decline as long ago as the late 1970s. Guide Brent Crowe, who fishes many days each year from Pickwick to Guntersville, told me a couple of years ago that he had just “heard of one” being caught. That’s how bad the sauger fishing had become. Guide Gary Harlan told me that it had been “four or five years” since he had seen a sauger in his boat while fishing Pickwick Lake. Guide Roger Stegall said that it was once common for him to catch an incidental limit of sauger while bass fishing on Pickwick. The days of catching a 15-fish limit of sauger were definitely gone, however. In my early days of fishing, I spent much of my time below Wheeler Dam with occasional trips to the Wilson tailrace. I watched fishermen catch sauger from the bank by casting jigs while boaters landing better numbers on heavy jigs fished vertically or on live bait around wing walls, locks, and just off the current in the tailrace. “The Hole” below Wilson Dam, that area between the turbines and the lock, served as perhaps the ultimate destination for boaters, a treacherous, rocky path to a delicious meal. The tailrace below Guntersville Dam was another go-to destination for anglers in that area intent on catching sauger in the winter months. Long since banned, snagging sauger (and other game fish) was also prevalent, especially below Wheeler Dam and to a lesser extent below Wilson and Guntersville dams. When the current was just right and pushed down the wall that extended downstream from the base of the dam at Wheeler, snagging a limit of sauger was a normal occurrence. Even after snagging was outlawed in the early 2000s, good numbers of sauger still existed and could be caught in traditional ways. The fish arrived at the dams around Thanksgiving and lingered through the spawn, usually around March and into April in certain years. They then retreated to their summer habitat, generally downstream into much deeper water where they were largely undisturbed by fishermen. Anglers rarely targeted them from late spring to early fall, occasionally finding them by accident and catching numbers on deep-diving crankbaits and plastics. Incidental catches of at least a few fish were common among crappie and bass fishermen even during warm-weather months. No definitive reason exists for the decline in sauger populations. State biologists have suggested at times that the sauger numbers were not as depleted as suggested by fishermen, that the declines were simply the low points in the natural cycle. But the lack of fish was obvious, and fishermen were quick to blame various factors ranging from water quality to striped bass for their lack of success. State officials eventually placed a series of limitations on sauger fishing, the most recent a five-fish, 15-inch minimum limit implemented in 2016. What are the exact causes? For the most part, anglers and scientists can only speculate about the specific reasons for the decline. The water quality argument is an obvious one but does not fully explain how certain other fish populations can flourish – the largemouth explosion on Pickwick, for example – at the same time the sauger have disappeared. Perhaps the biggest culprit in the perspective of many fishermen has been the continued presence of striped bass, which are present in all TVA reservoirs but especially predominant on Pickwick. Stripers grow big, up to about 40 pounds. A fish that size can easily eat a 15-inch sauger given the opportunity. Biologists, however, do not agree with the popular theory that stripers are detrimental to game fish populations. Regardless of what caused the decline, biologists always point to poor recruitment, a technical term that suggests the number of young of a species that survives from birth to a more mature stage. “The sauger population has shown extreme changes over the past decade,” said Phil Ekema, District 1 Fisheries Biologist for the state Wildlife and Freshwater Fisheries Division who is based in Decatur and works the entire length of the Tennessee River in Alabama. “These changes are predominantly a result of the variable recruitment that is observed on the Tennessee River. The causes for the poor spawns are also difficult to pinpoint, but one possibility is the variability of current from year to year – too much or too little current generated by the TVA – during peak spawning times in late winter and early spring. In general, juvenile sauger fish drift downstream immediately after birth, and too much or too little volume impacts mortality to the point of potentially killing entire year classes. Overharvest has also probably played a significant role in the past with many of the fish removed from the river being females of prime spawning age of two to five years. 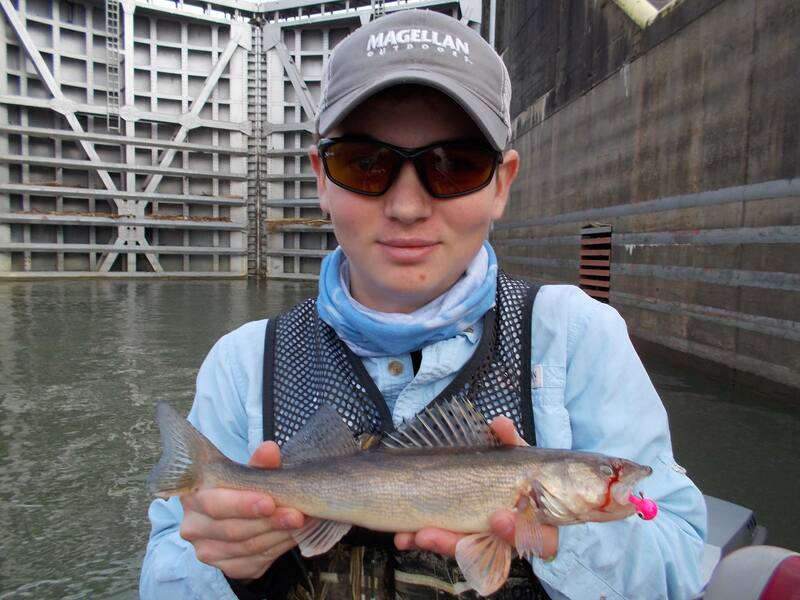 Both Harlan and Stegall, long-time guides on Pickwick, suggest the minimum length limit on sauger is too restrictive. For those anglers feeling nostalgic about the good old days of sauger fishing, some positive news can be reported from the last couple of years. At least a few fish have started to re-appear, especially on Pickwick and on the upper end of Wheeler below Guntersville Dam. Marks, in fact, said he caught a good limit of 16- to 18-inch fish while he was bass fishing back in the spring. Ekema echoes that idea, both from personal experience but also from a scientific perspective. Ekema said he had received reports of better catches from the fishing community and improved results from winter sampling. 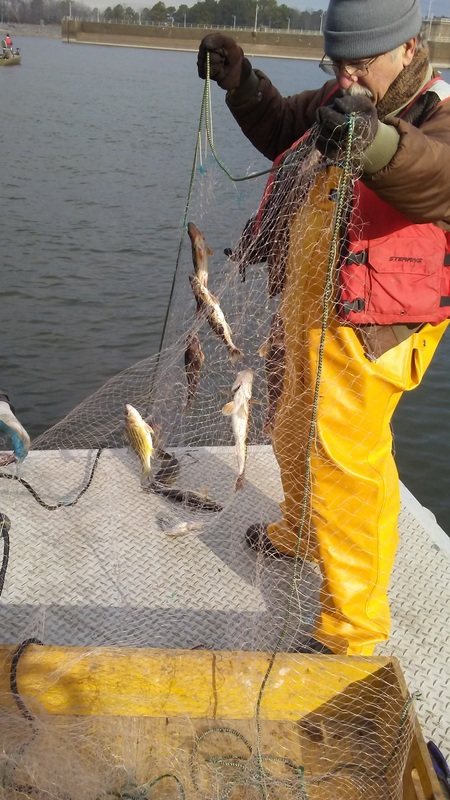 Flood conditions during the winter months in recent years had kept sampling surveys to a minimum, but netting in February of this year produced 174 sauger for Ekema. Most were in the one to two-year age range, indicating that spawning had taken place in recent years and an improved number had survived. Sauger grow fast, reaching 15 inches and sexual maturity by age two. Ekema’s netting surveys revealed at least some mature females capable of reproducing. Whether the sauger fish population will ever recover to the levels of years ago remains to be seen, but at least some hope exists now, something that didn’t exist five years ago because the fish had become such a rare catch. In the minds of some diehard fishermen, the sauger fish was once synonymous with winter fishing on the Tennessee River. A continued lack of the delectable fish certainly leaves a major void for fishermen. Here’s hoping that they come back. Thanks for the great article, I’ve been looking for some answers as to the decline in sauger population and this is the best info I’ve come across. I do have a question though, has anyone looked into trying a restocking program ?